Meet Philadelphia abortion doctor Kermit Gosnell, a man who has been charged with the murder of a woman and killing seven full-term delivered healthy babies by cutting their spinal cords with scissors. Notice that he catered to poor women, minorities and immigrants. Interesting how Planned Parenthood, an organization that receives over $300 million per year in federal grants and is the nation's leading profiteer in the abortion industry, sets up the majority of its clinics in poor and minority neighborhoods. UPDATE: Gosnell worked late night hours in unsanitary conditions, hiring staff without medical credentials to administer labor inducing drugs to women. Gosnell's medical license was revoked early last year and he has been under investigation by a grand jury and was named in at least 46-medical-malpractice suits. Gosnell charged $325 for first-trimester abortions and $1,600 to $3,000 for abortions up to 30 weeks. Abortions are legal up to 24 weeks gestation in Pennsylvania, although most doctors won't perform them after 20 weeks, prosecutors said. Gosnell got his medical degree from Thomas Jefferson University in Philadelphia and is board certified in family practice. He started, but did not finish, a residency in obstetrics-gynecology, authorities said. "He does not know how to do an abortion. He's not board certified," Assistant District Attorney Joanne Pescatore said. "Once he got them there, he saw dollar signs and did abortions that other people wouldn't do." The people who ran this sham medical practice included no doctors other than Gosnell himself, and not even a single nurse. Two of his employees had been to medical school, but neither of them were licensed physicians. They just pretended to be. Everyone called them “Doctor,” even though they, and Gosnell, knew they weren’t. Among the rest of the staff, there was no one with any medical licensing or relevant certification at all. 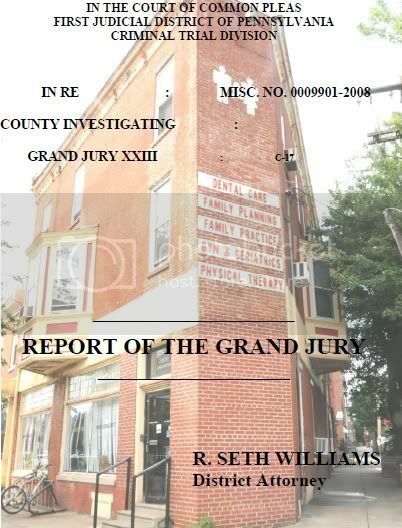 You can read full the report from the Grand Jury investigation here and here.